» Is My Contact Lens Inside Out? "Is My Contact Lens Inside Out?" this may sound like a really silly question, but surprisingly it is not. This mistake is more common than one may realize. There are markings on contact lenses which tell the wearer which way they have to be worn. But it is a Catch-22 situation. The wearer needs to wear the contact lenses to see those markings. So it may be that a contact lens user may never get to see those markings. How then, will the wearer come to know which way is up? New users of contact lenses are more prone to this problem. Even if they have placed the contact lens in the correct position in the case, it is possible that the lens has changed its position while immersed in the solution. So it is very easy to mistakenly fit contact lenses in an inside-out position and not ever realize it until some discomfort is felt. There are however a few ways of knowing the correct position of the contact lenses. The contact lens should be placed on the tip of the finger and pressed lightly so as to form a cup. View the lens from the profile. If the cup forms a smooth parabola in profile, then it is the right way round. If the curvature is not uniform but flared outwards, then the lens is inside out. If the cup test is not conclusive then this unconventional but effective method can be used. Place the lens on the palm of the hand and gently start to curl the palm as if forming a fist. By doing this, two edges of the lens begin to curl upwards to form a taco-like shape. If the edges come together smoothly then that is the correct side of the lens. But if the edges offer some resistance and do not shape easily, then it is the wrong side. If all else fails, technology brings to you an ultimate aid to understand inside-out from the right way round in contact lenses - videos! Yes, some enterprising ophthalmic organizations have actually made videos which demonstrate how to get the correct side of a contact lens. These videos are freely available on the internet. If you are looking for such a video, then make sure that you pick one that shows oversize models of contact lenses. In the video, the volunteer actually holds an oversized contact lens (about the size of a dinner plate), and bends it the wrong way to simulate the appearance of an inside-out contact lens. Will Wearing Contact Lenses Inside Out Cause Damage to the Eye? It is not a matter or undue concern if a contact lens is inside out. It will not cause any damage to the eye, but it may feel uncomfortable. Some wearers also have been known to complain of dizziness and nausea as a result of inside-out contact lenses. But there is no need to be unduly alarmed about this as such reports are quite rare. The lens will still work but not as effectively as when fitted correctly. 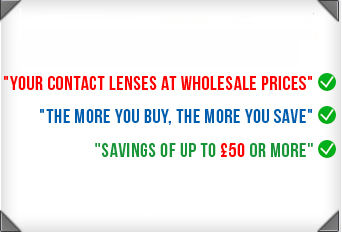 The vision may not seem right, so the practical thing to do would be to remove the lens and replace it correctly. So for whatever reasons, it is advisable to wear contact lenses correctly in order to avoid discomfort and poor vision. Wearing a contact lens in the correct position is as important as maintaining clean and hygienic lenses. To a new user, it can be especially frightening if the lens suddenly does not behave the way it should. This aspect of contact lenses usage tends to get neglected. There is so much else to be told to the new user, that this often gets overlooked. It is hoped that this short article will give some positive guidance and help people, especially newcomers, to wear their contact lenses correctly from the very start.